How much of your income do you spend on housing? For millenials in San Francisco or New York City, it looks like spending more than three quarters of your take home pay on home payments might be par for the course. RealtyTrac just released a list of the most and least affordable counties for millienials (those of us born from 1977 to 1992) to buy and to rent. 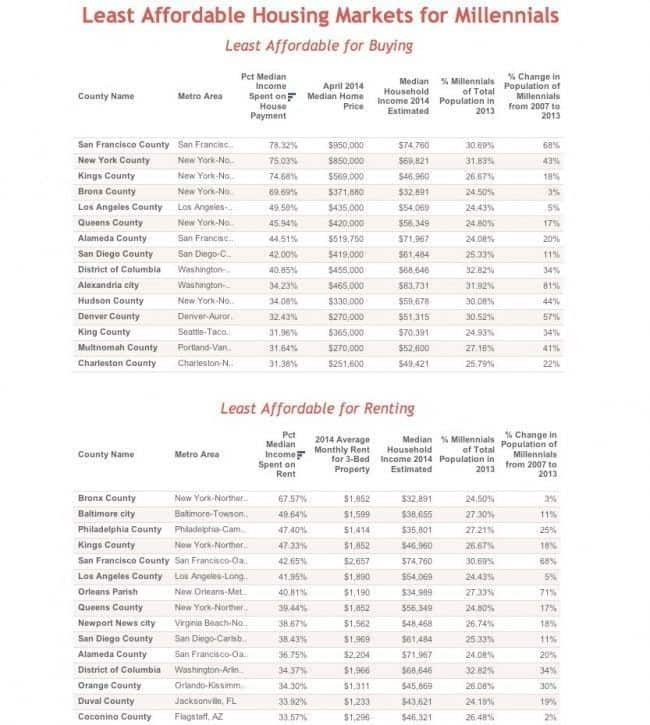 While there are affordable and expensive counties throughout the country, multiple counties in New York, Los Angeles, and San Francisco are some of the Least Affordable places to buy AND to rent. Counties in the Southeast and Midwest that top the Most Affordable lists might not be quite as happening as NYC or San Fran, but millenials there are spending less than a quarter of their income on rent. The study looks at counties with a population of 100,000 or more where millenials comprise at least 24 percent of the total population (the national average is 22%). RealtyTrac estimated the 2014 median household income for applicable counties and contrasted that with median home payments and average rents. Richmond County, GA, (encompassing Augusta, GA) tops the list of most affordable counties to buy a home, while Bossier Parish (home to Shreveport, LA) is the most affordable county to rent. San Francisco County, CA is the least affordable county to buy in, closely followed by three New York City counties. Bronx County, NY tops the list of least affordable counties for renters. The results of this study are helpful in understanding how millenials choose to spend their money on housing in various areas around the country. This data should not be used as an investor’s primary source of information when choosing an area to invest in. Excellent Article, thank you for identifying these areas. I am going to dig into these counties deeper and try to pull a great deal. Thanks Chas! I hope to be contributing many more articles going forward. Glad you found it interesting. 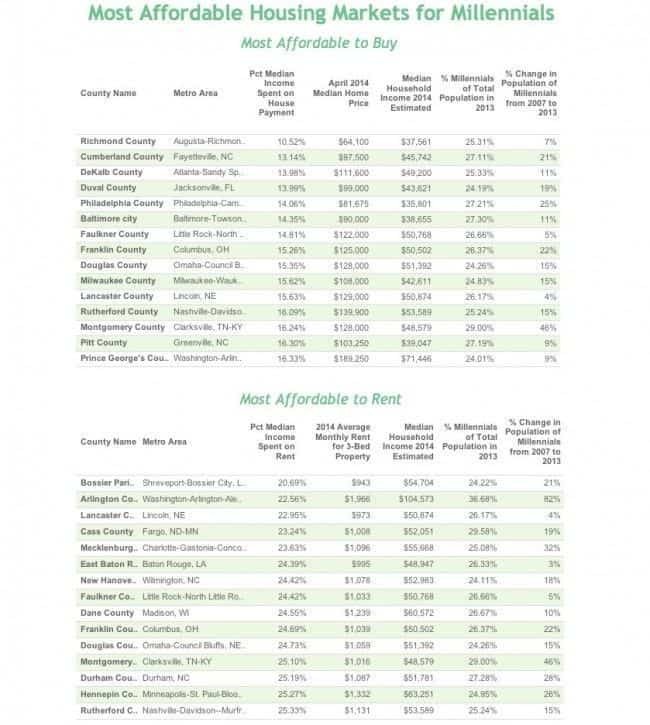 I see my city in the list of most affordable to rent. Should I take that to mean in general rent prices are low compared to home prices, and therefore it is probably not the best place to invest? Jake – I don’t necessarily think that low rent prices indicate that properties in your area won’t make a great investment. Keep in mind that this data is an average and investing opportunities can be very diverse within the counties listed. I know this is an old article but as a millennial I had to comment. This is a little misleading in New York for rentals. It is true that those living in the Bronx on average spend a larger portion of they paychecks on rent than those living in Manhattan, but this doesn’t accurately portray what millennials can afford. It doesn’t take into account how many wealthy people are living in Manhattan skewing the results. It was much much harder to afford rent an apartment in Manhattan ($3,945 on average in November 2015), as well as half of Brooklyn and Queens, than in the Bronx.